If you've ever dreamt of having your own pool, but don't have a lot to spend, this ingenious solution may be a blessing. In just a few hours, you can build your own swimming pool for a fraction of the normal cost. 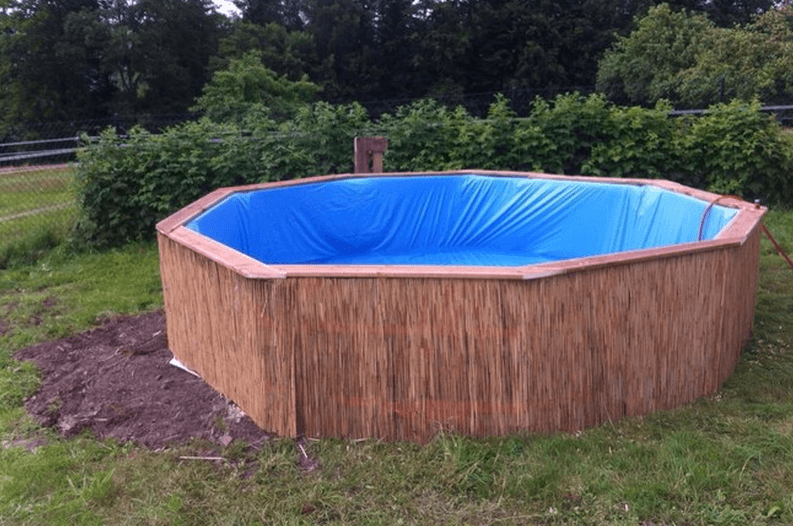 Thankfully for all of us, Torben Jung decided to take matters into his own hands (literally) and built his own pool out of just a few basic recycled materials. Jung says the project cost him less than $80, which is a much cheaper than pre-made or ground-installed pools. Check out the slideshow to see each step of Jung's building process. First, you'll need to lay down a large tarp and begin to place your pallets together to form the pool's base. Next, screw those pallets together and add pieces of wood to the top to keep them connected. Now, cover the interior with waterproof lining. Warning: You'll need a lot. Add your final layer of lining and staple it neatly to the sides of the pallets. Consider adding a pump to the inside to keep the water clean. Clean up the exterior by adding some wood paneling. After that, just fill it up with water and enjoy! A view of the finished product from afar. You can also adjust the instructions to make a pool of a larger or smaller size. It would just take a few pallets to make a kid-sized pool. If you want to be fancy, use extra pallets for a deck area and matching furniture. The possibilities are endless.